In the fall of 2007, a new fifth-grade student arrived at Symonds Elementary School. His demeanor was reserved, and his attitude about attending a new school was skeptical. For this 11-year-old, life started in an orphanage, and many of his learning, social, and emotional challenges stemmed from this deprived early experience. Maintaining positive relationships with peers and adults was difficult. Like all of the other Symonds' students, he began his days with a morning meeting, worked with teacher support in large and small groups, experienced academic choice, lived by rules and consequences, attended art, music, physical education, and media classes, and became a part of the Symonds community. One day, he was walking up the stairs to his classroom with his teacher and asked, "Why is everyone so nice here?" She answered, "Who we learn with is as important as what we learn. It's important to show that we care about each other. There is a specific set of social skills that children need to learn and practice in order to be successful academically and socially: cooperation, assertion, responsibility, empathy, and self-control. How, we the adults at school, work together is as important as our individual competence. At a morning meeting that happens each day, students are welcomed with a written message, greeting, news and announcements, sharing, and an activity. Rules are clear, simple, positive, and generated with children. Student hopes and dreams guide rule creation. Logical consequences are a consistent approach to discipline. Classroom organization promotes a caring environment and maximizes learning. Academic choice invests children in their learning. A method known as Guided Discovery is used to introduce materials and how to care for them, and to encourage inquiry. It is important to reach out to parents as partners in their child's learning. A strong school community is central to Symonds' positive school climate, building the relationships that drive learning. Students, families, and faculty share a sense of place, ownership, and connection at Symonds. Community meets the basic human needs of safety and belonging. Daily classroom morning meetings, weekly assemblies, and use of common language for expectations and rules are mandated practices at Symonds. They serve and support our community in numerous ways. Symonds has added its own flavor to these practices. Families are invited to participate in morning meetings and weekly assemblies. Each non-classroom teacher (i.e. reading specialist, school counselor, art teacher, media specialist) is assigned to a classroom for morning meeting. These assignments change four times during the school year. 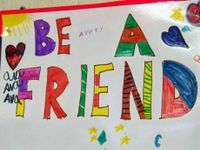 Students and non-classroom staff have the opportunity to interact with each other in a different way. In some cases, students may not have other contact with this staff person due to the nature of his or her job, so this practice emphasizes the importance that we all are part of one community. Morning meetings at Symonds support other initiatives as well. We use this time to bring buddy classes together. Many of our primary classes have an older buddy class. The classes gather at a morning meeting and share a greeting and a partnered activity, such as reading books or creating an art project. The grade levels have a chance to share what they are doing. Morning meetings are also a time for introducing Sprinklers to the class. All fifth-grade students are considered Sprinklers. They join K-4 classes during our weekly assemblies as role models and helpers. Sprinklers rotate classrooms during the school year. Students start their official role as Sprinklers by joining a younger class' morning meeting to be introduced and participate in the greeting, sharing, and activity of the day. Morning meetings and weekly assemblies have helped us integrate other programs that support social learning, such as Social Thinking developed by Michelle Garcia Winner. Symonds chose to include Social Thinking vocabulary and strategies into its common language and practices to strengthen children's ability to think about others as they work and play. During a weekly assembly, we introduced the idea of Whole Body Listening through a student-created presentation and a song written by our music teacher. For five days following the assembly, greetings and activities during morning meeting focused on Whole Body Listening throughout the school. There are many more examples of how our school has used Responsive Classroom practices to support academic and social learning that are beyond the scope of this post. The flexibility of these practices is an attractive feature of this approach. This year we will use Responsive Classroom techniques to continue developing the core values that make us a strong school: the Four Pillars of effort, kindness, knowledge, and community. These pillars stand comfortably on Symonds' Responsive Classroom foundation. The enduring message remains "Who we learn with is as important as what we learn." This blog post is part of our Schools That Work series, which features key practices from Symonds Elementary.